Children can't seem to get enough of juice boxes. And while parents appreciate the compact convenience, the individually-sized drinks are often pricey per serving, high in sugar, low on real fruit, and the tetra packaging is not biodegradable. In fact, more than four billion of these little cartons fill landfills every year. 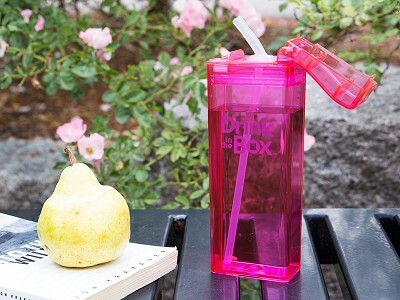 Drink in the Box is a healthy alternative that is eco-friendly and enables you to control what your kids are drinking (more water, less corn syrup). 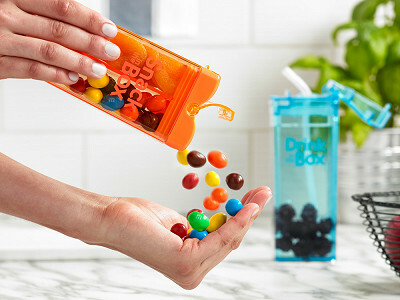 Designed by Toronto-based Marc Heinke, the patented Drink in the Boxes are made with highly durable Tritan, a food safe, BPA- and phalate-free material that’s dishwasher safe and doesn't cloud after washing. 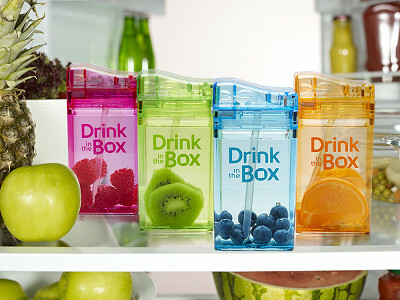 It looks just like a prepackaged juice box and fits more easliy into lunch bags than a water bottle. 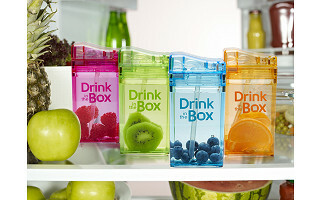 Leakproof, with an easy open/close design, Drink in the Box won’t explode or squirt everywhere, minimizing spillage. Mix drinks yourself, reduce waste, and use over and over again. That's thinking outside of the box. Hi I'm Marc, the President & CEO of Precidio Design, the company behind Juice In the Box. We set out to create a healthier, simpler, reusable way for kids to enjoy the fun of drinking out of a juice box while minimizing sugars, waste and maximizing health benefits. No more lost straws or squirting disposable Juice containers! With Juice in the Box it's easy to encourage healthy drinking and sustainability at the same time, plus, kids absolutely love them! Don’t be surprised if your teenagers also take them from their younger siblings, they are fun and cool! I thought that the price was for a set of four boxes but when I went to place the order, it asks for a color. Can you clarify, when I order 1, is that 1 set of four or 1 box? Thanks for this question as others might also be wondering. These are not being sold as a set. You purchase individually and choose a color for each one you put each into your cart. So, if you'd like to purchase 3 or more, you choose a color for each one. The $11.95 is for 1 juice box. Does that help? Is there a code for the free shipping? Good question. When you put 3 or more into your cart, the discount will automatically show up at checkout. Can I freeze the box with juice in it? Hi Kathy, although some people do freeze it with juice in we do not recommend it, as there is a chance the expanding of the frozen beverage could compromise the seal as it melts and leak out in a lunch box. We recommend to insert a few ice cubes, this also adds more water and further reduces intake of sugars. Freezing isn't recommended as it might cause the seal to not work properly. Other than that, it won't hurt if you do need to freeze it. @Amy Researching the material Tritan produced articles that bring the products safety very much into question. I applaud addressing the throw away culture, but potentially hazardous plastic, possibly associated with estrogenic and or endocrine disruptive properties makes it a no go for me and my new granddaughter. @Guest Hi, I am a little confused. Are we (the consumer) supposed to put juice or whatever we are giving our child to drink in the juice box? Also, where are the boxes made? Yes, exactly. As you'll see in the video, we are selling just the juice box and you are free to put your favorite drinks right into the juice box. 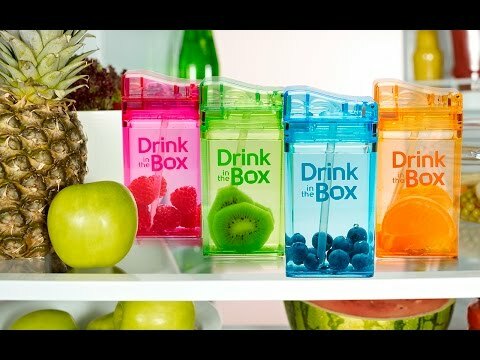 This makes it so that you aren't throwing away plastic juice boxes and you can use your own juice. Guest - Thanks so much for taking the time to comment here and we completely understand that you need to do what's right for your family. We too are watching the research closely and feel that Juice in the Box is a good option for those who want a durable and re-usable alternative to the traditional tetra-packed juice packages. I know this is an area that Marc is very knowledgeable in and feels strongly about. I'm sure he will be more than happy to address your concerns here.